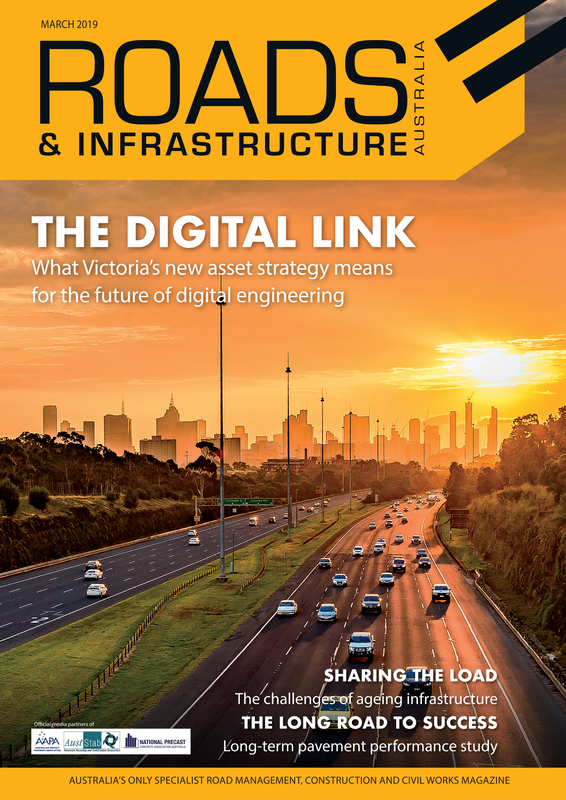 Gough Industrial Solutions has partnered with Chinese concrete giant SANY to offer competitively priced truck mounted concrete boom pumps to the Australian market. Australia is in the midst of a construction boom, with cranes dotting the skyline of every major city. To fuel this construction requires concrete, and in large amounts. To meet this demand, Gough Industrial Solutions has become the exclusive dealer of SANY concrete equipment in Australia. Derek Liu, Regional General Manager at Gough Industrial Solutions, worked with SANY for eight years before joining Gough. In his previous role at SANY he was responsible for developing the Asia-Pacific region, including Australia and New Zealand. He says SANY equipment is a market leader in concrete machinery, with more than 25 manufacturing bases, 100 offices and 8000 suppliers worldwide. “SANY first entered the Australian market in 2007, however, for a period we refocused and acquired German manufacturer Putzmeister. Its machines were of high quality and provided a top of the line service,” Mr. Liu says. Mr. Liu says SANY and Putzmeister shared technology across several brands to help develop new technology. 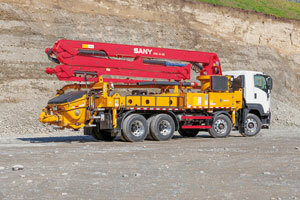 Because of this, SANY’s truck mounted concrete boom pumps were able to be refined into a competitive product. “With some of the most advanced technology available, the Putzmeister concrete pumps were some of the most reliable machines on the market. However, they also had a premium price tag which put off a lot of people from buying them,” he adds. This is where SANY hopes to fit in the Australian market, giving customers more choices when it comes to quality technology, while staying affordable, Mr. Liu says. The pump’s remote controlled articulated arm also allows it to manoeuvre tight spaces and busy sites. 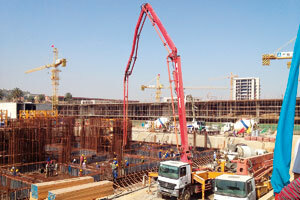 The boom pumps are able to accurately place concrete and pump it at high volumes. Because they are mounted on the back of a truck, they can be moved with ease to ensure they avoid disruption and can reach difficult areas. Because of their mobility and size, Mr. Liu says truck mounted concrete boom pumps excel in built up urban environments. “Boom pumps are easy to move. With tall buildings, trailer pumps work best but for projects like houses, yards or workshops, mobility is key,” he says. Mr Liu says the highest boom is 60 to 70 metres long, meaning it can be used on buildings up to 10 storeys high. He also explains that to service taller buildings, a SANY trailer mounted pump can be utilised, adding that 80 per cent of concrete is pumped by SANY owned technology. “The truck pump is easy to use and can take advantage of the truck’s engine to pump the concrete. The boom is able to move from up to 30 to 66 metres, giving it significant range” he says. Additional features have been added to improve the design. This includes a one-button fixed boom position that can be used via a remote control and rotary braking technology to reduce vibrations and decrease the boom’s rotary swing amplitude by 60 per cent. Mr. Liu says the computerised smart boom system helps make operating the device easier, by providing one-button boom folding and unfolding, with the ability to limit operation range and locate boom pressure from a remote control. He adds that energy saving technology has been added to increase pumping efficiency by up to 25 per cent and reduce fuel consumption by up to 10 per cent. A fault self-diagnosis is also included in the pump to protect the machine from any damage, as well as having resilient parts, Mr. Liu explains. “Chinese factories use standard machines in their manufacturing, they’re designed to be simple and effective. When SANY exports to Australia or other developed countries like the United States, SANY uses a different design,” he says. Mr. Liu says after Gough Industrial Solutions and SANY partnered last year, they’ve already sold 10 units, with plans to grow in the Australian market. “Australia’s market is not as big as China’s, but there’s still a large market for concrete pumps. We’re looking to do play a large role in the market in a short period of time,” he says.